Don M. Winn is a multiple award-winning children’s author of eleven picture books and four children's novels. His Sir Kaye the Boy Knight® series of novels for independent readers include The Knighting of Sir Kaye, The Lost Castle Treasure, Legend of the Forest Beast, and The Eldridge Conspiracy. Don's picture books include: The Higgledy-Piggledy Pigeon; Superhero; Twitch the Squirrel and the Forbidden Bridge; Shelby the Cat; Space Cop Zack, Protector of the Galaxy; and many others. Don has been writing for over 20 years. After beginning with poetry, Winn moved on to writing children’s picture books. Almost immediately, his growing young readers begged for chapter books, which led to the creation of the Sir Kaye series. As a dyslexic himself, who well knows the challenge of learning to love to read, Winn's goal is to write books that are so engaging they will entice even the most reluctant or struggling reader. Don's articles on dyslexia have been featured in TODAY Parenting, the Costco Connection Magazine, MD Monthly, Latin Times, and many others. Winn lives in Round Rock, Texas. In The Eldridge Conspiracy, Book Four of Sir Kaye the Boy Knight Series, author Don M. Winn offers middle-grade readers an adventure they are sure to enjoy, as three boys, roughly 12 years of age, journey together while facing some of life’s greatest physical difficulties and emotional traumas. Their leader, Kaye, son of the famous knight, Sir Henry, is saddled with the undeserved reputation of being clumsy and accident-prone. He is, thus, pained to have earned a nickname he has come to loathe: Sir Don-Kaye (Sir Donkey). Even so, upon discovering a plot against the king, Kaye takes off to set things right, only to be followed in short order by his friends, Beau and Reggie. Shortly, two thugs, Birket and Fulkes, chase the three lads to and then from an abbey, to the city of Kingsbridge (where the boys save a man and his family held captive by threat), and finally, to the city of Rombauer Castle on the Day of Remembrance. But will they make it in time to save the king? The three adventurers, Kaye, Beau, and Reggie, lack nothing in the way of resolve and creativity as they uncover the nefarious Baron Thomas’s plot, yet they do so in the face of serious odds. Kaye, who seeks to be a great knight like his father, suffers from feelings of inadequacy. No matter what he does, he feels he doesn’t measure up. Meanwhile, Reggie, the self-proclaimed Royal Chronicler of the group, has difficulties with reading and writing, in addition to which, he is prone to getting lost. It is these touches that Don M. Winn has added to The Eldridge Conspiracy (which he dedicates to all dyslexic and struggling readers), with which every young person will be able to identify at just that time in life when they are beginning to discover their own true selves and their own life missions. Books of adventure and challenge that still offer an emotional component are hard to come by for middle grade readers—and even more so for middle grade boys—yet Don M. Winn hits the mark dead center with The Eldridge Conspiracy. The Eldridge Conspiracy by Don M Winn is the final installment of the Sir Kaye the Boy Knight Series. Sir Kaye’s dad is in no small amount of danger and Kaye and his friends go into Eldridge to look for the only person who can save him. Along the way, they come across an evil baron, Baron Thomas, who is attempting to take the throne of Eldridge for himself. Making themselves enemies of the baron, the boys’ journey takes on some perilous twists and turns as they face the evil baron’s henchmen and have to stop an assassination from happening, one that would push the countries back into a full-scale war. Can Sir Kaye and his friends succeed? Will they find the one person who can help Kaye’s dad? Tune in to the final installment of this thrilling series to find out. The Eldridge Conspiracy (Sir Kaye the Boy Knight Series) by Don M Winn is a great children’s adventure book. I didn’t read the previous books in the series, but I did find it easy to understand this story and what was going on because Mr. Winn provided sufficient background. This is an action-packed story, one that is full of twists that take the boys deeper into danger. This is more than just a fictional story; it teaches children about life, about friendship, making decisions, and about not putting too much stock in pride all the time – sometimes pride gets in the way of making the right decision. Great story. I would recommend that the whole series be read in order to get the most out of it and I think all kids will enjoy this tale. The Eldridge Conspiracy: Sir Kaye the Boy Knight, Book 4 is a fantasy adventure novel for children and preteens written by Don M. Winn and illustrated by Dave Allred. Reggie was concerned when Beau nudged him awake in the middle of the night. Kaye had left without them, and his two friends could only guess that he was trying to find his father. Sir Henry had been gone for two years now and was living in Eldridge in the king’s castle as an ambassador. Kaye’s concerns about the well being of his father and the king were well-founded, but Reggie and Beau were determined to catch up with their friend and help him with his quest. They didn’t get very far, however; as they were soon apprehended by Birket and Fulkes, two villainous men the boys had gotten the better of in the past. They escaped, but something the two villains said gave Beau and Reggie concern that Kaye’s fears were indeed well-founded. There was a conspiracy afoot; Baron Thomas of Denbrooke had set in motion a foul plan that would result in the king being slain at the hands of his close friend, Sir Henry. The three boys were bound and determined to ensure that it did not happen. 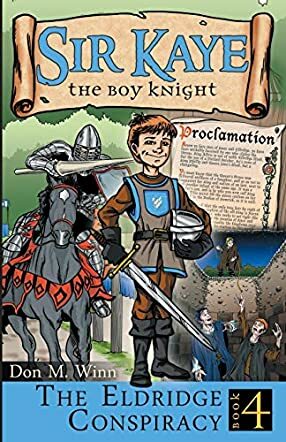 Don M. Winn’s fantasy adventure novel for children and preteens, The Eldridge Conspiracy: Sir Kaye the Boy Knight, Book 4, is an exciting and fast-paced tale about three 12-year-old boys who take chivalry and knightly conduct quite seriously, and it’s a very inspiring read. Reggie, the narrator and chronicler of Sir Kaye’s adventures, is dyslexic and has trouble writing, something he actually uses to his advantage in this fantasy tale. Kaye just wants to be like his father, and he blames himself and his failings for his father’s two-year absence. As they race to the tournament site where the treachery is to take place, each of the three boys comes of age in his own way. Reggie learns that he has value and importance as the Royal Chronicler, and Kaye discovers that being his own knight is far better than trying to emulate someone else, even his father. The three of them follow chivalric precepts instinctively as they work to free a woman and her child who were taken hostage. I loved following how the boys use their wits, ingenuity and dogged persistence against foes far stronger and more powerful than they are. Can you achieve impossible things? Sometimes, you can, as Reggie, Kaye and Beau discover in this fourth volume in the Sir Kaye the Boy Knight series. The Eldridge Conspiracy is most highly recommended.